These pictures were taken on March 21st. 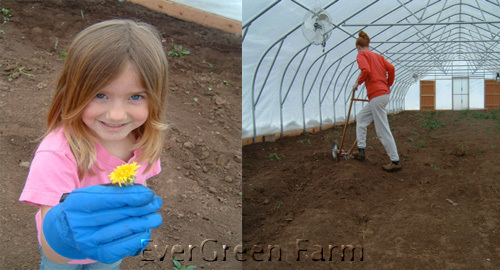 Sophia (one of our younger CSA membes) and I were out working in Greenhouse #4. 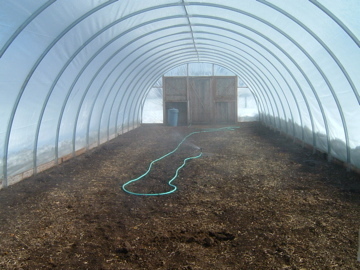 It is a monster of a greenhouse (3,000 square feet) and it was in need of some weeding. Some weeds had grown a foot tall and were already flowering. Sophia was absolutely thrilled to find a dandelion. She picked it and enthusiastically said "My first dandelion of the year! I want to plant it!" I suggested she take it home to plant. I'd like to give a BIG THANKS to our Smoot neighbors, Tom & Amy Klindt of Horizon Signs, for helping us with the design and artwork (and being ever so patient with all of our changes). 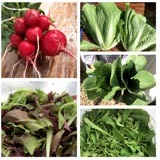 For any who may still be interested in joining our CSA for the 2007 season, please contact us directly before mailing in your paperwork or check. At this point, we have filled all memberships being delivered to Jackson Hole. There are approximately 5 memberships available for the Star Valley area. Anyone interested in becoming a Workshare should also contact us directly. Thank you for your support! It's not really fair for me to say I'm the one who started the work on the farm this year. After all, Shain and his father Max have been working on the two new greenhouses periodically since the end of last season. There have also been the routine farm chores we do all winter: mucking out chicken coops, goat barns, and horse corrals; making compost; researching and ordering seeds and supplies (Shain's job); paper/computer work to organize the coming season (Tara's job); etc... Lots to do. But for me, "the real work begins" when we start working the soil. So on February 26th I started working in Greenhouse #1. 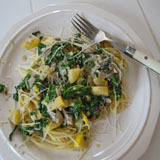 This is what it looked like before. Ideally, all of the dead plants and weeds would have been cleared out at the end of last season, but we ran out of energy. Work day #1 was a day spent on my hands and knees pulling and/or digging up the remains last year's basil, cucumber, watermelon (yes, we managed a few watermelon! 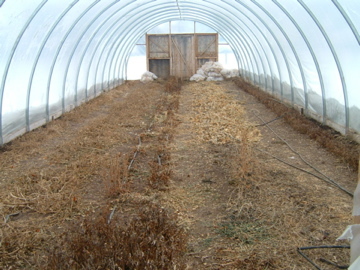 ), and tomato plants. The remains of which were added to the compost pile. The nice part of this farm chore is that I was able to spend a day in a greenhouse where the temperature is considerably more comfortable than outdoors (I was working in a t-shirt and jeans). 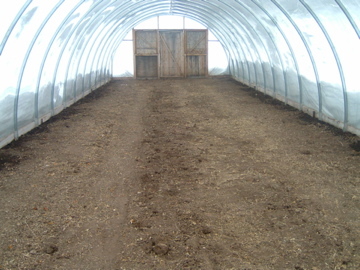 At the end of work day #2, the greenhouse was looking much better. I was amazed to find several weeds still alive and well, especially the quack grass which was thriving along the side walls. But it's (mostly) gone now. 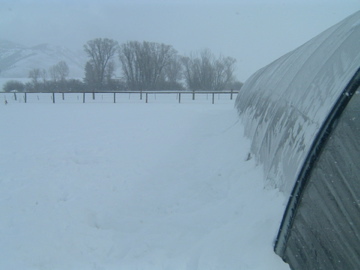 I thought I'd show you a picture of what the weather is like on the OUTSIDE of the greenhouse on Day #2, just for comparison sake. The next step would usually be watering the soil so it can soften it up and be worked. On day #3, the temperature wasn't cooperating enough to get water running. So Shain decided to try working the soil anyway. He has been looking forward to having a day he can spend working outside in the dirt. 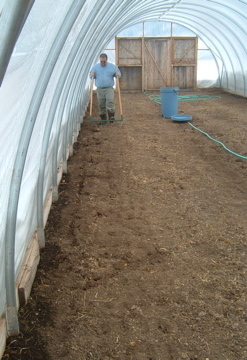 Here he is using a broad fork to break up the soil. Day #4. The sun has finally started to shine and by about noon the hose has thawed enough for me to water. We watered two days in a row, until the soil was moist about 6 inches deep.